A few years back Bjork threw "Medulla" in our direction, which was a completely accapella set of tunes. For better or for worse, this was my shark jumping moment for Bjork as nothing she's made from that point on quite got my attention as the earlier recordings did. 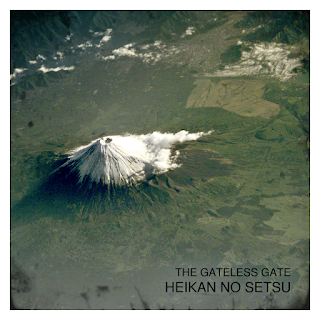 Now, the Gateless Gate, whose first album I absolutely dig have dared go that route with their second release. Fortunately, my admiration remains. Whereas Bjork seemed to use the vocal approach simply as an excuse to go "bip bip PFFEW!!!" over and over again, this album bases much of its vocals in throat singing and other sacred and shamanistic Eastern music. I don't like it quite as much as the debut, but it's a fascinating and welcome progression. The Gateless Gate are certainly not repeating themselves (or himself if you want). I think the Gateless Gate remains an Eastern-flavored act to keep up with. This album is certainly an interesting diversion, but I'll definitely have my ears perked up for a less constrained recording. I think the best music is created under limitations, but it's also important not to less those limitations overpower the core of the music. Fortunately, this disc remains quite interesting over the course of its running time despite the rather extreme limitations. This EP length platter of engroovied, hissing analog electronics are as if Moog pioneers Perrey and Kingsley had been down with Brian Eno oblique strategies instead of betraying their background in showtunes with tracks like "Baroque Hoedown." The music seems to exist just outside of our dimension, with the prominent tape hiss subtly mangling the music and practically serving as another instrument. The sound is minimalist, yet impressionistic and of a decidedly different percolating flavor than the typical experiental electronic cassette. The two sides both clock in a ten minutes and thirty seconds, as if Merkey is working under the clock. The first half is a gently pulsing Berlin sequence, being forced and warped out of shape by the whims of a mad scientist. It's almost like a snippet of a Boards of Canada track getting disintigration looped. Side B is like a tiny tone generator from the 60's, wishing to be synth pop, but in fact busily shorting out along side its primordial rhythm machine and ghostly, phasing vocals. Coming all the way back from 2010 spans several eternities in the piledriving, bandcamp present. This means a lot of music gets unduly buried, and this is a winner for the sonic travelers looking for a jaunt through the "Logan's Run" filtered retro future.